"Consider this a gateway paella and the first step to a serious, lifelong addiction. When I first do a version of a classic dish like paella, I try to use a minimum number of ingredients and steps to focus on technique. After learning the method, you'll ideally use a wider variety of ingredients, like clams, mussels, squid, and chicken, which will make your rice that much more interesting. Garnish with extra virgin olive oil, freshly chopped flat-leaf parsley, and lemon wedges." 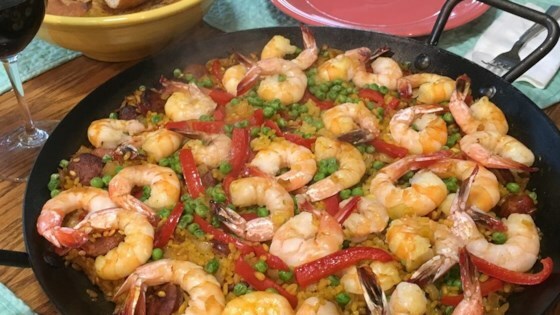 See how to make a quick version of classic Spanish paella with shrimp & sausage. You can substitute smoked paprika for the paprika. You can use hot chicken broth in place of the hot saffron broth. You can use any smoky, spicy sausage in place of the chorizo sausage. Very tasty. Definitely will make this again ! Not too quick, not too easy, but well worth it !